Congress members called for executives at the utility company to blame for September's natural gas explosions and fires in Massachusetts to step down Monday as they held a special hearing into the disaster. The six House and Senate members from Massachusetts and New Hampshire who held the hearing at a packed middle school gymnasium in Lawrence took aim at the corporate culture at Columbia Gas of Massachusetts and its parent company, Indiana-based NiSource. They painted a picture of a corporation that cut corners and lacked the internal procedures to prevent, let alone respond to, the Sept. 13 disaster that killed one person, injured dozens more, damaged more than 100 homes and left thousands without heat or hot water in the Merrimack Valley communities of Lawrence, North Andover and Andover. 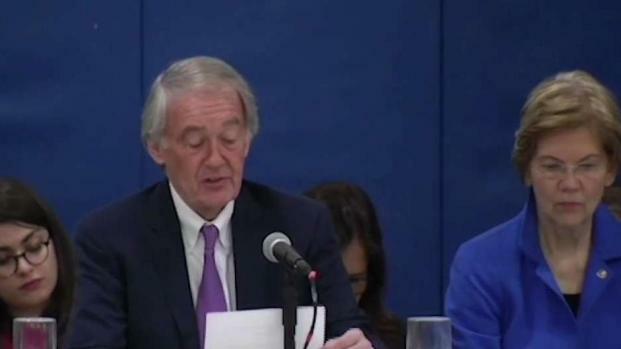 "At every step of the process, there was a chance to avoid this disaster," said U.S. Sen. Ed Markey to company executives. "Instead of choosing safety, you chose savings. Instead of choosing to do things the right way, you chose to do things the easy way and the result was disaster." Lawrence Mayor Daniel Rivera suggested Columbia Gas should not be allowed to operate in Massachusetts. "Break it apart, revoke their license, make them sell their business to someone else," he said to the congressional panel. "Columbia Gas should cease to exist. No second chances." Asked by Markey to give Columbia Gas a grade for its response on the night of the explosions, he said "those who were close to this would give them an 'F'." He said he actually broke the news of the disaster to company executives when he called them that night. "I wasn't in contact with anybody from Columbia Gas for several hours after the event occurred," Andover Fire Chief Michael Mansfield added. "Due to the lack of communications, due to the lack of organization, the lack of their emergency planning, I would give them an 'F'." 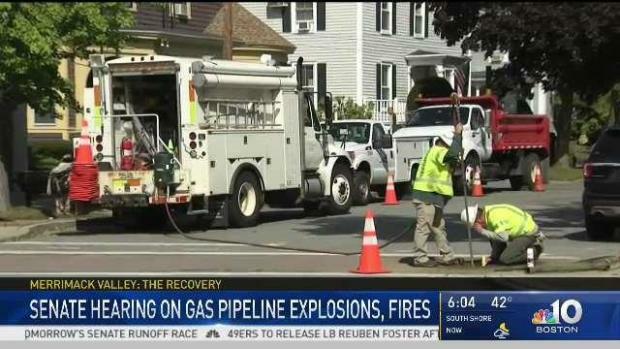 Joseph Hamrock, CEO of NiSource, and Steve Bryant, the president of Columbia Gas of Massachusetts, promised workers were doing everything in their power to restore gas service to thousands of customers despite missing an initial goal of full restoration before Thanksgiving. The company now says the process should be complete by early December. "I know our work has been far from perfect," Bryant said. Emotional testimony was heard during Monday's U.S. Senate committee hearing in Massachusetts to review the response to the natural gas pipeline explosions in the Merrimack Valley. Sens. Elizabeth Warren of Massachusetts and Maggie Hassan of New Hampshire, and U.S. Reps. Seth Moulton, Niki Tsongas and Congresswoman-elect Lori Trahan of Massachusetts also attended Monday's hearing. In addition, residents affected by the explosions attended and were invited to submit their own testimony online. The family of 18-year-old Leonel Rondon, who was killed after a chimney dislodged and landed on him after the explosions, were among the first to speak at Monday's hearing. "We will not let this loss be without meaning," his sister, Lucianny Rondon, said. "The grief we feel is unbearable, but we know Leonel will want us to stay strong." Warren pushed the executives to disclose if anyone had been fired as a result of the disaster, but they declined to say. She also noted that Columbia Gas has been responsible for a number of gas leak incidents in Massachusetts in recent years. "I just want to figure out what personal responsibility looks to you two," she said to Hamrock and Bryant. "You kept your jobs and you're still getting paid what sounds like a lot of money." U.S. Senators are demanding answers from Columbia Gas on the Sept. 13 disaster. 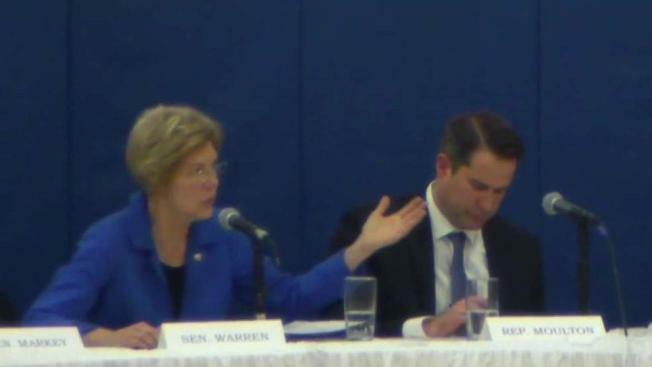 Warren then asked utility executives how much they were paid. "My compensation is a matter of public record, and it's in the range of $5 million," answered Hamrock. Bryant told Warren his salary is about a half million dollars. Both men said they won't take pay cuts but might lose certain incentives. Warren also wanted to know why Columbia Gas handed out space heaters to residents that did not end up working in most of the homes in Lawrence. "When you announced the plan to provide space heaters, did you know that almost 90 percent of the homes in the region couldn't handle them," she asked. National Transportation Safety Board Chairman Robert Sumwalt testified the agency is making its investigation into the natural gas disaster a "high priority," but added that its final report is still months away. 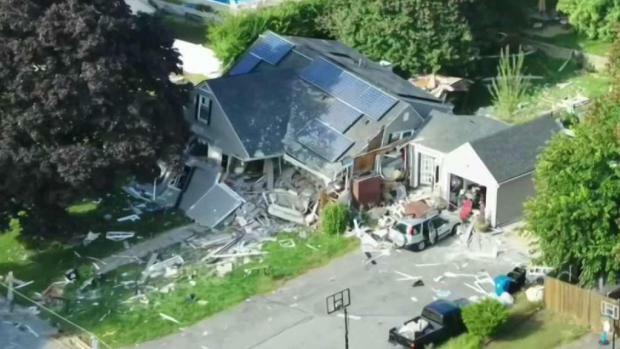 A preliminary report released last month said over-pressurized gas lines led to the explosions that rocked the Merrimack Valley. The hearing will focus on responses to the Sept. 13 explosions and fires in Lawrence, Andover and North Andover that killed one, injured about two dozen, and damaged more than 100 structures.